Stepping off the metro platform at74th & Broadway, the street that lies directly under the elevated rail line is like no other in New York City, and arguably the country. The bustling of shoppers with bags and strollers, the smells of tacquieras, the clinking of the subway above, honking of cars on the underlying street and the sight of Spanish dominating the advertising landscape all are a part of Roosevelt Avenue’s unique position as an immigrant commercial landscape. There are several factors that help in maintaining Roosevelt Avenue as an ethnically diverse, immigrant-friendly landscape including the very subway built above it. The accessibility of public transportation in Jackson Heights, Roosevelt Avenue especially, is critical for the growth of an immigrant population. Another factor that helps shapes Roosevelt Avenue’s commercial landscape is the high density of a wide variety of businesses that service the many needs for the surrounding community. These businesses have developed to suit the needs of the immigrant population, including all-Spanish advertising and services that help new migrants establish themselves, find housing and employment, as well as staying connected to their country of origin. 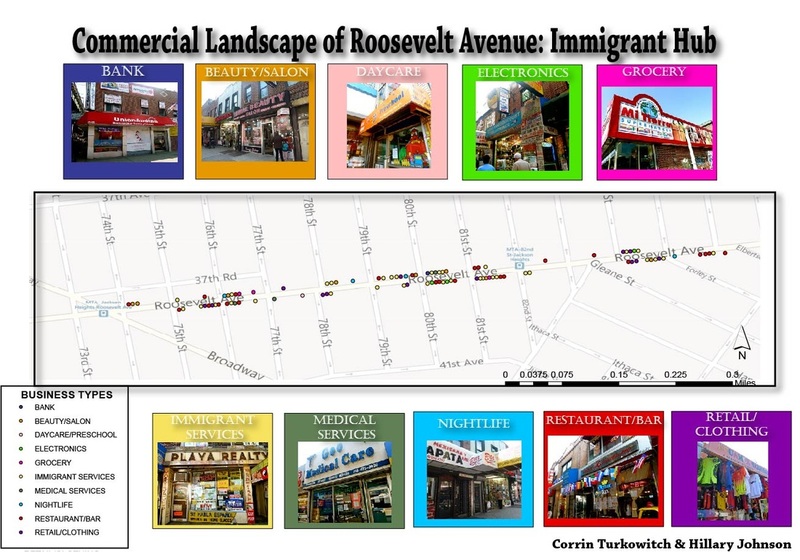 Along with serving practical needs for immigrants, Roosevelt Avenue also seeks to preserve the cultural identities of the diverse populations through place-based names, flags, foods, nightlife, imports and an emphasis on co-ethnicity. Thus, Roosevelt Avenue reflects the physical and cultural needs of the vast and diverse immigrant population that find employment, housing, consumer services as well as cultural identity through the landscape. Map 3 below shows the variety of services available to residents of the area. Roosevelt Avenue’s business district would arguably not exist as the thriving commercial landscape it is if were not under the Number 7 elevated rail line, a central metro line running through Queens to Manhattan. Three subway stations service Roosevelt Avenue from 74th street to 82nd alone, representing the high density and heavy foot traffic the commercial transect experiences (see Figure 1). The line, which was originally built for upper-class suburbanites to commute to and from Manhattan, now serves middle-class immigrant populations. Many immigrants, especially recent arrivals do not own vehicles so public transportation is essential for access to employment. The combination of public transportation and affordable housing is shown in history as being an attractive and viable space for immigrants to settle (Miyares, p.463). Miyares, Ines M. "From Exclusionary Covenant to Ethnic Hyperdiversity in Jackson Heights, Queens." Geographical Review. 94.4 (2004): 462-483. Web. 12 May. 2012. <http://www.jstor.org/stable/30034291>.